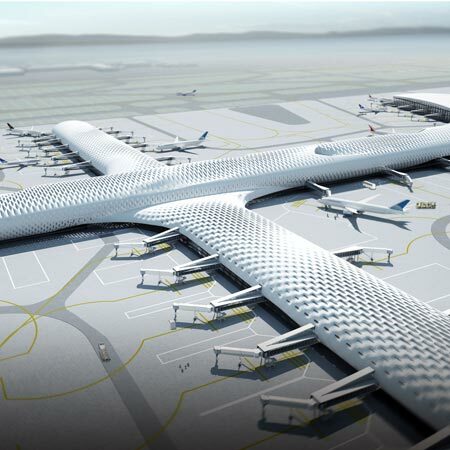 Italian architects Massimiliano and Doriana Fuksas have won the competition to design a new terminal at Shenzen Bao'an International Airport in China. The 400,000 square metre terminal will be built in three phases, with the final elements completed in 2035. Shenzhen is one of the most important industrial and touristical locations of whole China. Shenzhen is located in the southern portion of the Guangdong Province, on the eastern shore of the Pearl River Delta. Neighbouring the Pearl River Delta and Hong Kong , Shenzhen’s location gives it a geographical advantage for economic development. Shenzhen International Airport Terminal will be the gateway to the city of Shenzhen. The first and last image an air traveller has of a city are those created by the traveller’s impression of the airport. T3 in Shenzhen International Airport can positively influence the image that international, national business people and tourists have of Shenzhen. Globally - T3 at Shenzhen Bao’an International Airport must serve as the global aviation gateway between China and the rest of the world. Nationally - as the fourth largest following Beijing, Shanghai, and Guangzhou in China, Shenzhen Bao’an International Airport is a trunk of domestic flights and hub of national flights. Enhancement of transfer services between international and domestici flights will improve the distribution of wealth among all Chinese cities. Regionally - Currently, there are more than 40 cities with populations of over one million within 3.5 hours flying time of Shenzhen. This makes Shenzhen an excellent location for a regional hub. Passengers travelling from neighboring cities could fly to Shenzhen to connect with long distance global flights or flights to other Asian cities. In construction terms, its design optimises the performance of materials selected on the basis of local availability, functionality, application of local skills, and low cost procurement. Remarkably, it will have been designed and built in just few years. For the complete of T3 Shenzhen Bao’an Airport there are three phases. Consequently this way of extension can have merits not only for the aesthetic reason but also for construction. Designed for maximum flexibility to cope with the unpredictable nature of the aviation industry, like its predecessors, it aims to resolve the complexities of modern air travel, combining spatial clarity with high service standards. The passenger terminal and concourse constitute the major portion of the passengers’ perception of an airport. Factors which affect passengers’ impressions include processing times, walking distances, ease of orientation, crowding, and availability of desired amenities. Each of these has been carefully considered in developing the concept for the passenger terminal and concourse. The terminal is open to views to the outside and planned under a single unifying roof canopy. Natural light is coming through the skin that is double skins with pattern. The skin avoids direct sunlight to reduce energy consumption and creates elegant atmosphere. It makes the air travellers have marvellous impression with comfort. The plaza provides access to the baggage handling, departures and arrivals hall on the ground floor as well as to the cafes and restaurants, offices and facilities for business meetings. Void in the grand departure hall establishes not only a visual link between different levels but also the passages of natural light to the other levels. The grand departure hall has vast plaza with check-in counters that is brighten elegantly by the diffusion of light from the roof. This provides a pleasant waiting space with check-in desks, an information counter, car rental companies and airline counters. The mega-trusses are used to have this vast closed plaza. Travellers arrives at the terminal at 14m through the car way. The canopy of the airport can make them feel welcome with light effect that is created by double slit of canopy. After check-in two types of travellers, international and domestic departure is going to divide vertically. For international departure travellers has to go down using escalators while domestic travellers go to security area(CIQ) at 14m. Concourse area is one of key function area at the airport. Concourse area at T3 Shenzhen International Airport is composed with three levels. Each level is destined for independent function: departure, arrival, and services. The form of the concourse is simple, but elegant. It is also for the consideration of expansion of the airport in the future. The concept of interior space is fluid. There are two different spatial characters in concourse space. One is movement, the other is pause. Retails and waiting lounges will be islands for pause. Especially retails are key-tenant in concourse space, not only for the management of airport but also for the impression of airport with high-services. Retails and waiting lounges seem to be made naturally following spatial fluid. The inner skin is made of very fine net. The movement of this skin gives concourse space elegant atmosphere. When we see the concourse from 14m level it will be marvellous space. CLIENT/BANDITORE: Shenzhen Airport (Group) Co.,Ltd. DEVELOPER/ORGANIZZATORE: Shenzhen Planning Bureau + Shenzhen Airport (Group) Co.,Ltd.